While this may not cure the disease, it will let us know if CRISPR is a viable path towards a cancer solution. CRISPR is the gift that keeps on giving—when it’s not fighting blindness, tackling HIV, or even recording real-time immune responses, it is taking on the emperor of all maladies: cancer. But what’s even more fascinating about this use of CRISPR is that the National Institute of Health’s (NIH) Recombinant DNA Research Advisory Committee (RAC) has approved the first-ever use of CRISPR in human cancer therapy, a monumental step in the history of the gene-editing technology. Offensive: T-cells will be modified to have a gene that produces a protein that will help T-cells identify and target cancer cells. Removal: T-cells will be modified so that they do not have a protein that is theorized to inhibit cancer cell identification and targeting. 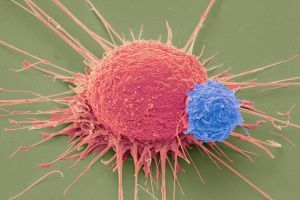 Defensive: T-cells will have a gene removed, so that they will no longer produce a certain protein that identifies them as Immune T-cells, thereby preventing cancer cells from inhibiting them. You may be scratching your head, thinking that approving this experimental therapy is a “no-brainer,” but human gene therapy trials have been bumpy since 1999. The story of Jesse Gelsinger echoes far too loudly with this team of physicians in particular—as Gelsinger was only 18 when he passed away in a University of Pennsylvania experimental gene therapy study. It was later discovered that members of the research initiative had hidden detrimental data from previous animal experiments as there was a financial stake involved in the success of the trial. While a member of the current team is believed to hold ties to Novartis, a pharmaceutical company that owns several T-cell technology patents, the scientific community is watching closely, and ensuring all precautions are taken. Here’s to a better tomorrow thanks to CRISPR.